A hearty breakfast is everyone's favorite way to fuel up before a fun day outdoors. To me, that means bacon. To my husband, it's something he can put real maple syrup on. But whatever your favorite breakfast consists of, here's three great ways to fuel those fun fires. 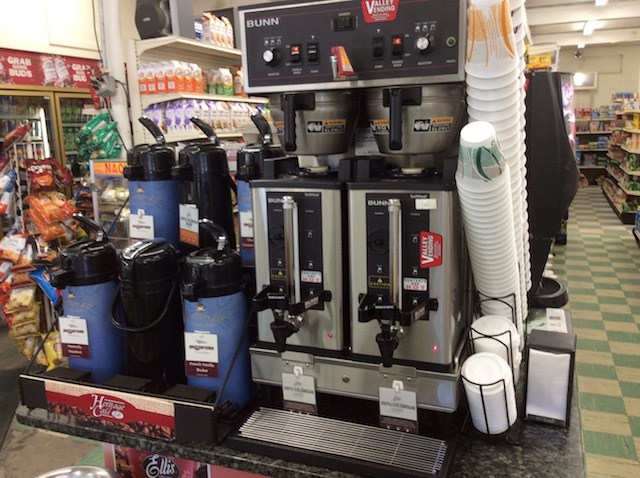 There are lots of vacation needs which can be met at the Little Super Market downtown. 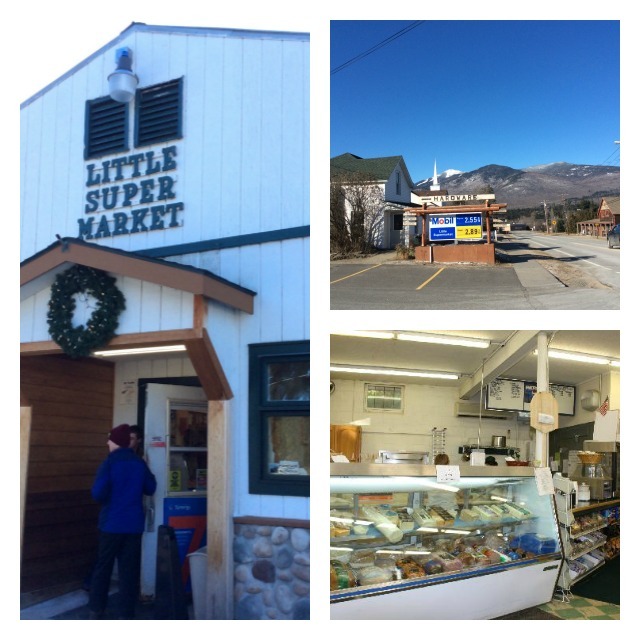 Fondly known as the "Little Super," this is like a Swiss Army knife of stores. It is a complex complete with grocery, deli, gas station, hardware, and The Salon. When we want to do a lot of things in a short time, this is the place. Locally, this is far more than a convenience store. The deli counter has a fantastic selection, there's produce and other local food, and they have been known to bake goodies. But if there is one item they are really known for, it's their sandwiches. I can say something like, "I hear the sandwiches at Little Super are good," and everyone falls all over themselves explaining just how good the last one was, how they debated their choice, they might get something else next time... and hey, you hungry? Let's go! So their breakfast sandwiches are built to a high standard. Their deli folks are very friendly and helpful. If it's possible, they will build it. As you can see, they are exactly the place to fill up that backpack. From jerky, fresh fruit, and nuts, to the celebratory homemade baked goods for the summit, there's everything an epic outing might require. While you are here, pick up sandwiches for that day's trek. If you are planning a day of downhill skiing, Centerplate at Whiteface Mountain is your destination. Base Camp Market opens at 8 AM (7:30 on weekends and holidays) with their Fire Pit Grill breakfasts. Go handy with a breakfast burrito or sandwich, or traditional, with the classic eggs with home fries, toast, and choice of breakfast meat. Carb-up fans may choose from pancakes, oatmeal, and a variety of cereals with milk. 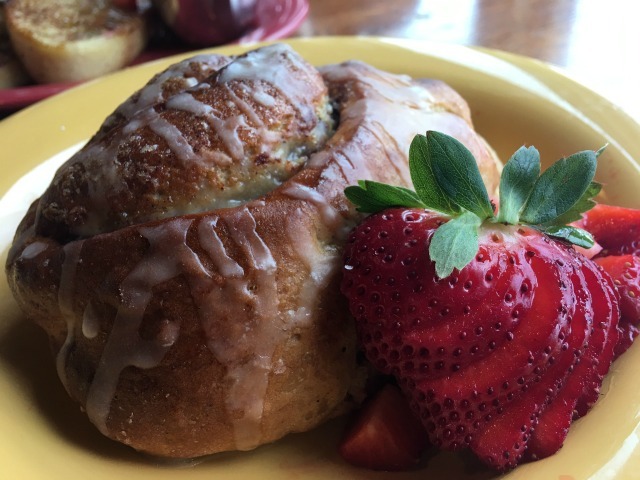 For fancier fare, J. Lohr Cafe & Wine Bar goes all gourmet on their breakfast, like a grilled blueberry muffin or fresh-baked cinnamon roll. Customize your own omelete made with cage free eggs. There's also the choice of a classic New York bagel. With lox, even. They open at 8 AM for a true farm-to-table dining experience. The emphasis is on locally produced produce and products. 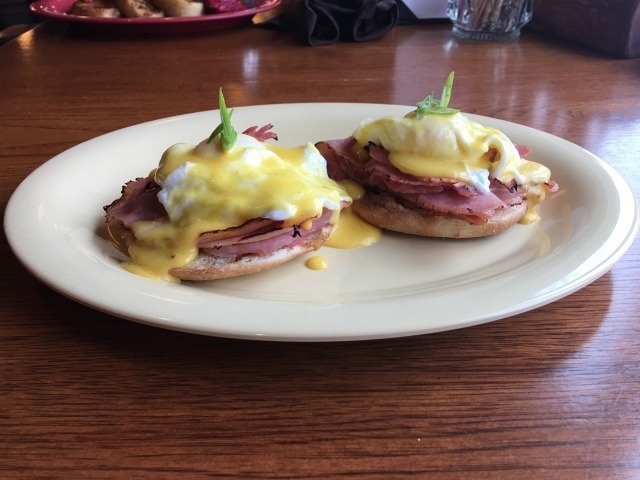 How about Eggs Benedict with your choice of Canadian bacon, smoked salmon, or smoked trout? For kids, the Black Bear Cafe opens at 8 AM (7:30 on weekends and holidays) and is located in Bear Den Lodge. Their selections are breakfast sandwiches and juices, designed for the littlest skiers, and their simpler tastes. If you couldn't wait to hit the slopes, the Mid-Station Lodge is open daily from 9:00 AM. This cafe is halfway down the mountain. Linger on their outdoor deck for breakfast sandwiches, hot beverages, and their own homemade trail mix. At Whiteface, there's fun year round. Even in the spring! 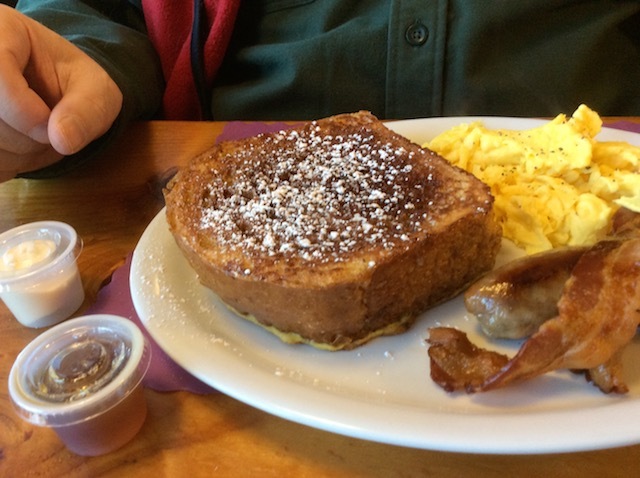 If you are a serious diner breakfast aficionado, (and I'm married to a man who is always ready for breakfast food), there's the Country Bear. French toast is actually not French. It is found in a collection of recipes from the 5th century AD, and dates back to the Roman Empire. In an ironic twist, French toast as we know it today was invented in... New York. An Albany, New York innkeeper named Joseph French started serving the dish in his restaurant in 1724. 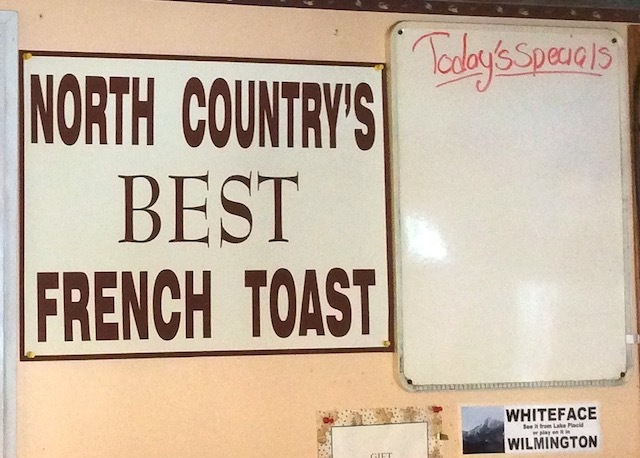 It became known in the States as "French Toast" because he left out the apostrophe in his ads. It was supposed to be "French's Toast." See? Poor grammar can mess up your bid for fame. So stay in school, kids. This charming little diner and bakery is a local favorite. In addition to breakfast served all day, they also do lunch. They are open from 7:00 AM to 2:00 PM, Friday through Sunday. They offer a full line of baked goods daily, including fresh baked breads, pies, and assorted doughnuts. They also do exquisite special event cakes, including wedding cakes decorated in any color scheme or decorating style to match the rest of your wedding. It's a homey place, with a couple of smiling ladies to do everything; taking the orders, cooking the breakfast, running the big bread slicer, chatting about the upcoming maple syrup harvest. In other places, people talk about the corn and bean crop. In Wilmington, it's about snow and maple syrup. It's their own special bread which becomes that famous French toast. As seen below, they serve one slice. But such a slice! This puzzled my husband at first, who had not seen any French toast yet. As he studied the special on the board by the door, he asked me, "Only one slice of French toast? That's different." Fortunately, I had insider knowledge. "I don't think you need to worry about it. We can always get you another one. And that's not all you are having." We settled in with mugs of really good coffee; an important part of my own breakfast. The menu emphasized they had cage-free eggs, which I appreciated, and my my my, they were good. I can taste the difference, my scrambled eggs were buttery and fluffy, just perfect. As was the bacon, a generous portion cooked to exquisiteness. 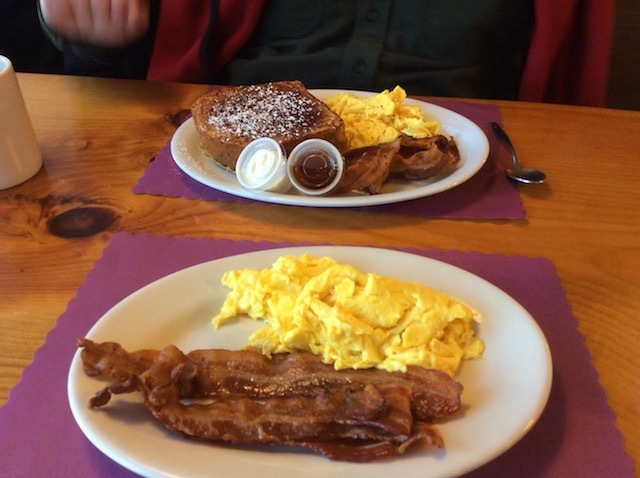 My husband's breakfast came with real butter and real maple syrup. He always specifies this, but when our server heard that, her response was, "Of course!" I really like that they don't think of anything else as the norm. Due to me being gluten-free, I had to enjoy this treat vicariously. After some oohing and ahhing over the lovely presentation of his French toast, he couldn't talk over his first bite. But his expression told me all I needed to know. "So," I teased when it was gone, "did you want another slice of French toast?" "Gosh, no! I could barely finish that one." We agreed. This place is worth the trip. No matter how long that trip might be. Their reputation for Heaven on a plate is fully deserved. Book a Bed and Breakfast. Explore our places for dinner. Find more fun things to do. 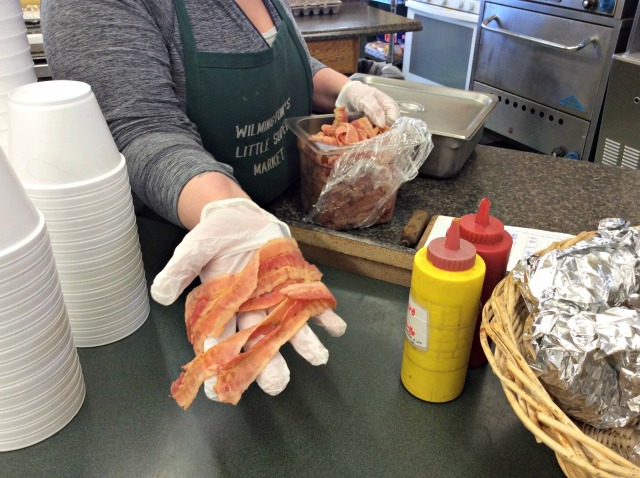 This week in ADK news: Bacon!